Lately it feels like balloons have made a comeback. Like, they were very cool when I was six and everyone got to bring a latex balloon home from a birthday party. After a long hiatus, it seems like balloons have become trendy. 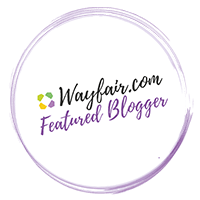 I’m pretty much obsessed with the balloon installations from Geronimo Balloons, and one of my fave DIY blogs, Sugar and Cloth, is always using them in shoots. They’re synonymous with celebrating, so why not embrace it? 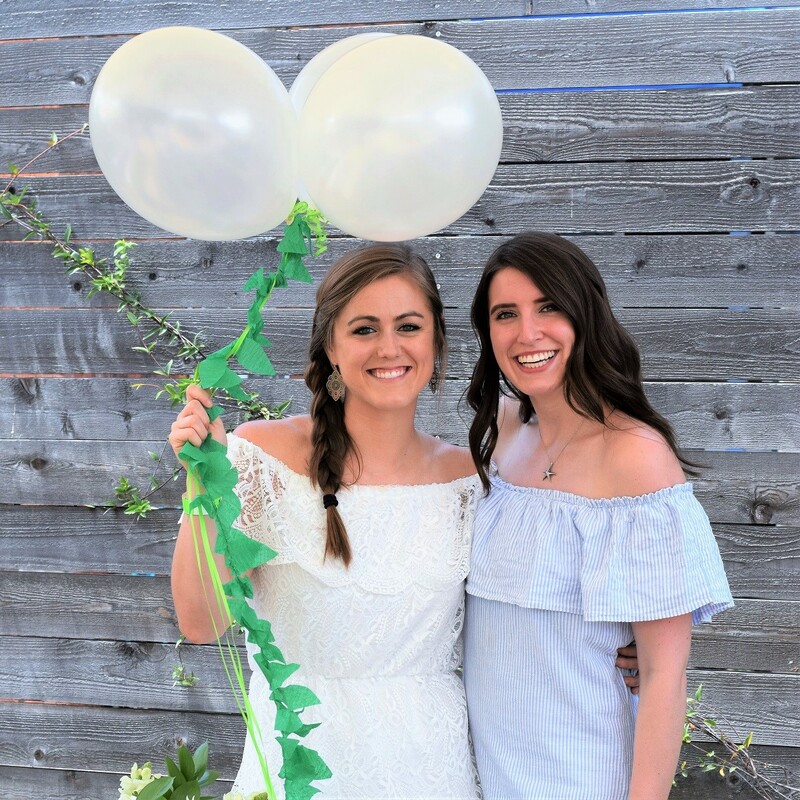 To make a cute photo prop, and something that would immediately grab people’s attention to find us at the bar for Megan and Ben’s engagement party, I wanted to make some cute balloon arrangements. Though I had originally wanted to use these huge, round balloons from Party City, they were almost $10 a pop once inflated, and it turns out 2 feet of balloon in real life is way bigger and aggressive than it looks in your head (someone had ordered 6 before us in line and had to come back 3 times to fit them all in the car). For about $1.50 each, I was able to use plain pearl white balloons in groups of three instead. What made them really fun was creating a leaf garland to tie to the strings! 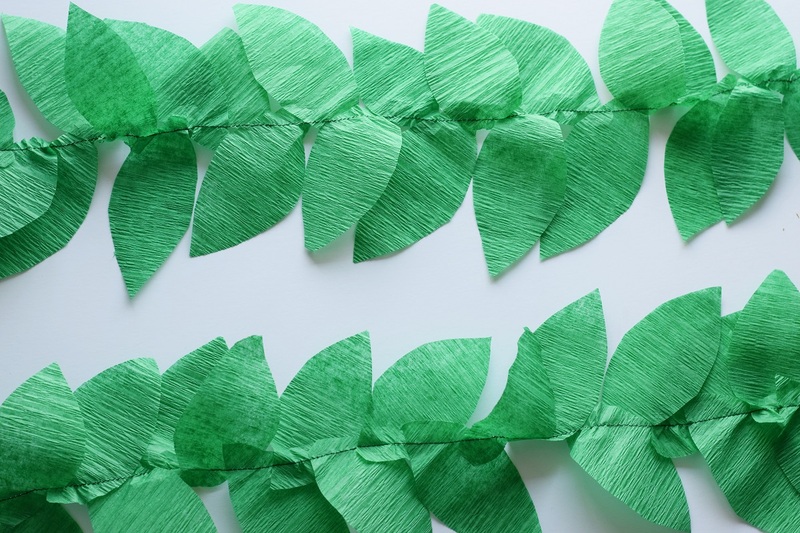 To do this, all you need to do is buy green streamers, cut out leaf shapes, and then sew them together using a sewing machine. I also ended up using some of the vines of leaves to decorate the table and tie in to the natural theme. 1. Start by cutting the streamers into about 4″ strips. Then cut out a leaf shape from the strip. You can work a few layers at a time by stacking strips together. These leaves don’t have to be perfectly the same since it looks more natural if you have a variety of shapes. 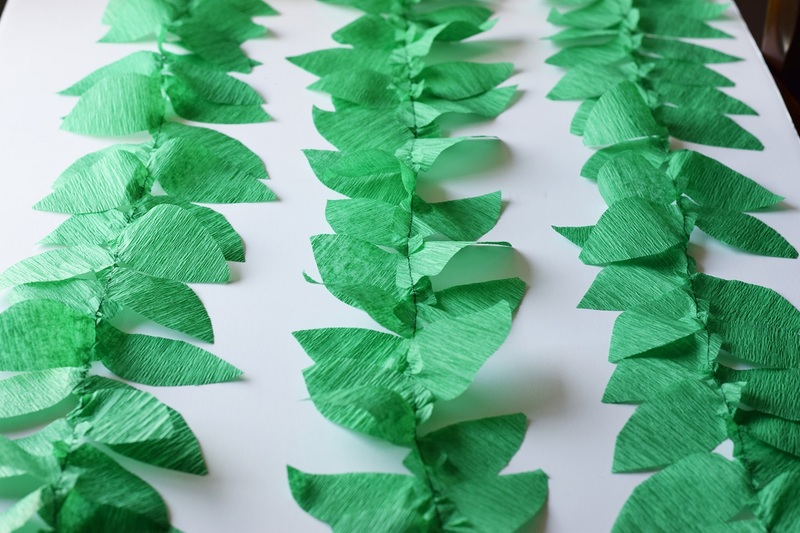 You will need to use at least a half a roll of streamers worth of leaves per balloon bunch. 2. Take your stack of leaves over to the sewing machine and start sewing a straight stitch through the ends. Moving slowly, feed another leaf into the machine as you get to the edge of the last leaf. This will allow you to slightly overlap each leaf in a vine pattern and keep them all together on one strand. Also make sure to alternate the direction of the leaves. 3. 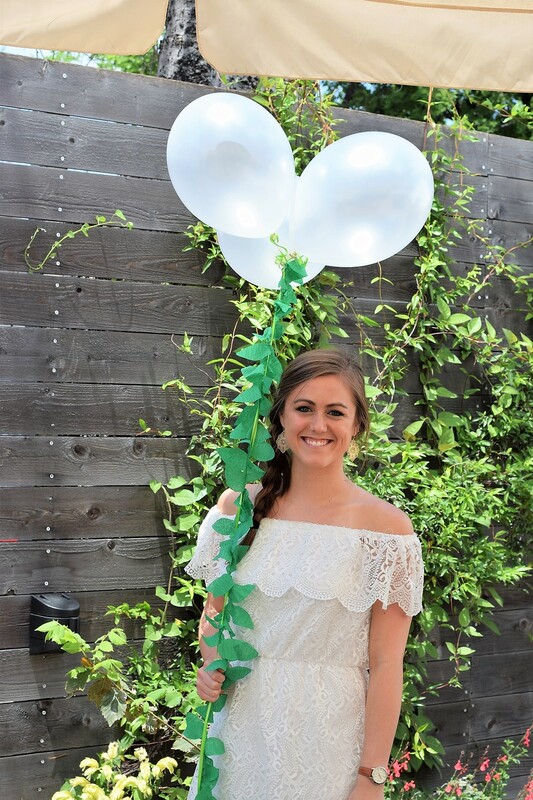 To connect the balloons together, staple the balloon strings at the top and then staple the vine of leaves to the top as well. I would recommend asking for white or green strings at the store when you get your balloons inflated. Make sure to tie the ends of your balloons to a weight, and then place them on a table or the ground! So pretty and festive. I’m doing this for the next pah-tay! Thanks for sharing. I’m just teaching my daughter how to sew, so we will give this a try. Thanks for sharing & your photos are wonderful!